Looking down Criminal Wing I in the Justice Prison at Nurnberg. Defendants of five case(s) now before military tribunals are confined to this part of the institution. 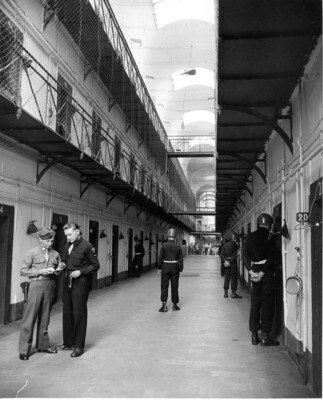 Baltic guards under supervision and orders of American authorities patrol the cells, and check each cell. At left Pfc. C. M. Newhouse of Donora, Pa. checks guard roster with Baltic interpreter.